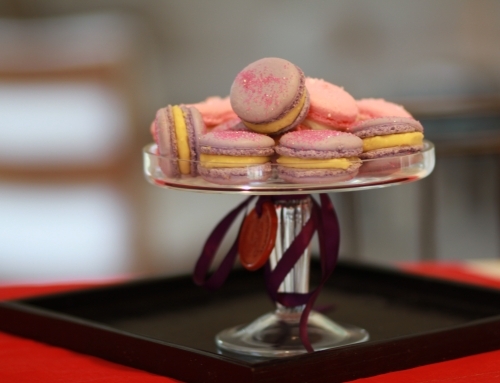 Nothing says the holidays like a delicate yet lightly crisp, French Macarons. 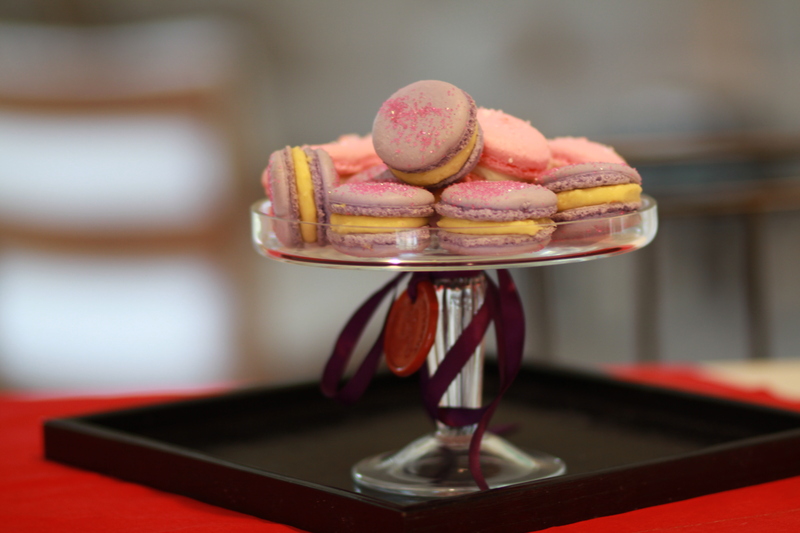 This weekend I filled a few dozen of my carefully baked French Macarons. 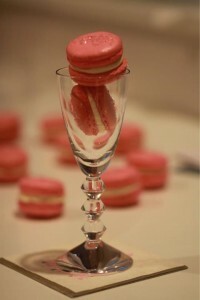 I am a big fan of the French pastry chef, Pierre Herme and only use his recipes from his book, Pierre Herme MACARONS. The rose pink French Macarons were filled with French Creamcheese Buttercream. 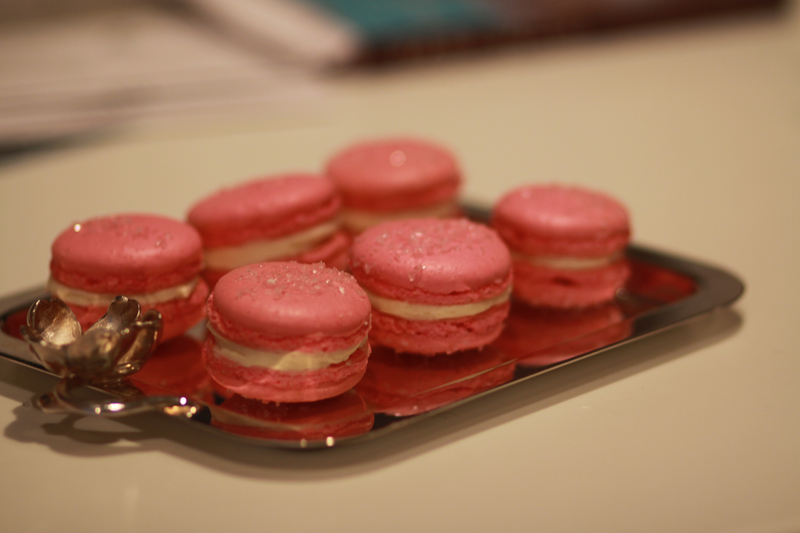 If you don’t own a copy of Pierre’s fabulous MACARONS cookbook, you should definitely purchase. Gorgeous photos with detailed recipes including his own signature recipes. And, you’ll need a quality digital scale. I use Yamato DKS – affordably priced and works perfectly. Sift together the confectioner sugar with the ground almonds (I use Bob’s ground almond flour) . Melt the cocoa in a bowl over barely simmering simmering water. Stir the food coloring into the first portion of egg whites. Add them to the mixture of confectioner sugar and almonds but do not stir. Bring the water and sugar to a boil at 245 F. When the syrup reaches about 200 degrees F, start whisking the second portion of egg whites to soft peaks. Once you reach the 245 degrees F start carefully pouring the hot syrup into the egg whites. Whisk and allow the meringue to cool down, then fold into the almond sugar mixture. * Fold in the melted chocolate. Spoon the batter into a piping bag fitted with a plain nozzle. Pipe rounds of batter about 3.5 cm in diameter, spacing them 2 cm apart on baking trays lined with baking parchment. Rap the trays on the surface to remove air. Leave shells to stand for at least 30 minutes until they form a skin. 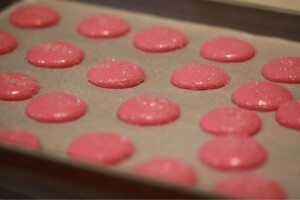 Preheat the oven (I use Tru-Confection for baking at 290 F) 320 F, then put the trays in the oven. Bake for 12 – 15 minutes. Out of the oven, slide the shells on to the work surface. *note: using a scale works perfectly to measure ingredients properly. In a saucepan, bring the sugar and water to a boil. When it boils, clean the sides of the pan with a damp pastry brush. Heat the sugar to 120 C.
In a bowl (I use a mixer with whisk attachment), whisk the eggs and yolks until they lighten in color. Pour in the hot sugar – slowly – and continue wishing until completely cool. In another bowl, use an electric mixer, whisk the butter until it thickens. Add the egg mixture and continue whisking until to obtain a smooth cream. Weigh out 250 grams butter cream and whisk in the cream cheese. Spoon the cream into a piping bag with a plain nozzle. Pipe mounds of cream onto your French Macaron shells (mine were made and tinted with Wilton Rose Pink and dusted with decorator sugar). Top them with matching shells. 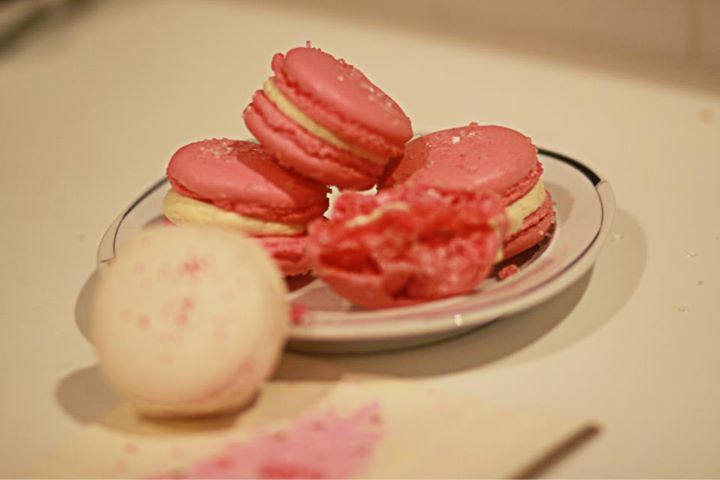 Store the macarons in the refrigerator for 24 hours and bring back out, serve at room temperature. Photos and recipe courtesy of intuitive consultant and writer, Victoria lynn Weston. Victoria lynn Weston is an intuitive consultant, writer and documentary producer. Her works have been broadcast on PBS, Wisdom Network, Canadian Television. Her documentary; “America’s Victoria, Remembering Victoria Woodhull,” chronicles the life of Victoria Woodhull, the 1st woman to run for US President in 1872 – was featured at the annual Montreal/Quebec International Film Festival – honoring 90th year women got the vote! She is the founder and President of MediaQuire.